The Beauty Diet was created by Lisa Drayer, a registered dietitian and health reporter, who is a regular contributor to CNN. Drayer also maintains a private practice in New York City, where she has helped many people improve their health and achieve their weight loss goals, including television celebrities, models, politicians and executives. 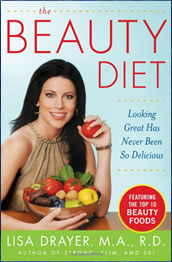 In her book, The Beauty Diet: Looking Great Has Never Been So Delicious, she highlights ten basic foods that she says will not only make you look and feel better, but will also help you to lose excess weight. Drayer introduces dieters to the ten foods that she says will enhance natural beauty and promote easier weight loss. These foods provide important nutrients required by your body for optimal cellular function and repair. For each of the foods she goes into detail about the nutritional components they contain and how they work to enhance specific elements of health and beauty. She advises dieters to include at least one of these foods with every meal or snack while following a 1500-calorie diet. In addition to the top ten beauty foods dieters are recommended to eat a wide variety of fresh foods each day. The Beauty Diet provides a four-week meal plan with over 100 recipes. The meal plan includes three meals and two snacks daily. Also included are beauty tips such as explaining why it is necessary to use slightly acidic topical treatments, the connection between vitamin B12 and gray hair and a recipe for a homemade facial mask. Wild salmon, low-fat yogurt, oysters, blueberries, kiwifruit, sweet potatoes, spinach, tomatoes, walnuts, dark chocolate, green tea, egg whites, feta cheese, goat cheese, turkey, avocado, figs, almonds, whole wheat bread. Exercise is recommended in the Beauty Diet because it burns calories and helps you to stay slim and beautiful. Dance, yoga and pilates are highlighted, however, dieters should choose any physical activities that they enjoy. The Beauty Diet: Looking Great Has Never Been So Delicious retails at $22.95. Explains how certain foods can enhance beauty and health. Includes unique information, advice and tips about beauty. Provides a four-week meal plan with recipes. Meal plans do not take individual variations in calorie requirements into account. Some of the recommended foods may be expensive such as wild salmon and oysters. Some dieters may not like the recommended beauty foods. The emphasis on beauty may not appeal to some readers. The Beauty Diet will appeal to readers who are interested in learning more about the connection between food and appearance. By including the top ten beauty foods in the diet each day, as well as following a generally healthy lifestyle, dieters should notice an improvement in the way they look and feel. However, while healthy foods are undoubtedly the foundation of any long-term effective weight loss plan, for the most part any weight loss achieved on this program is more likely to be due to restriction of calories, rather than any special qualities of the ten specific foods that are highlighted in this book.